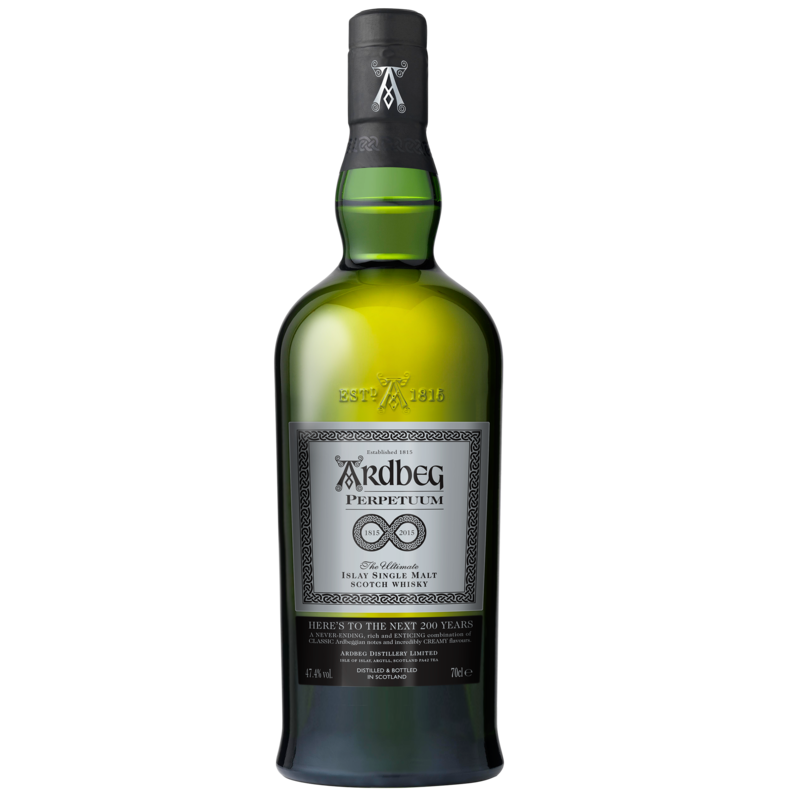 Ardbeg Perpetuum is a single malt that was released to celebrate Ardbeg’s 200th anniversary. It is comprised of whiskies of different ages, that have been matured in both bourbon and sherry barrels, and then combined to create Ardbeg Perpetuum. The whisky has a very pale white wine colour, similar to the pale yellow of a Pinot Gris. When swirled in the glass, this whisky forms a thin oily film that clings to the inside of the glass and as the film begins to recede evenly dispersed legs take form around most of the circumference of the glass. The legs stick to the glass long after the whisky is swirled around. Sweet toffee apple, sticky caramel, milk chocolate and luscious waves of vanilla soften the bite of peat and the sting of a ground peppercorn medley, which tease the nostrils with salty cubes of lean prosciutto. Ripe and browning peach, pear and nectarine develop with orange and lemon peel, with chocolate brownies and honey glazed pecans. This dram reminds me of a fresh cake of coal tar soap and a pecan pie… no, wait… make that also smoky myrrh and cured meats. This is an exotic and interesting bouquet. The flavours on the entry are somewhat subdued, though by no means boring. Peat, dark chocolate and mandarin peel are suddenly interrupted with a salty spray, and the flavours merge with spices and lead into sweet picked ginger. The whisky then becomes peppery, as a soft bed of creamy vanilla supports the peat. The saltiness progressively develops, first as salted caramel and then into cured meats – first lean and then quite fatty, with a luscious creamy film starting to form on the base of the palate. All the while there is a wooded smokiness, which remains a constant theme. The spices linger, with bit of butter and dark chocolate coated ginger bread. The palate seems to sweeten into the finish, first with pear and then with caramels. There is a fatty film that remains on the palate, with peppercorns and salty pancetta. Consider it, if you are a fan of Islay whisky and you enjoy a drinkable peaty malt. To say that this whisky is moreish or drinkable is an understatement, as evidenced by the fact that as soon as my whisky glass is filled with this malt it is not long before the glass needs refilling. At Ardbeg Day, similarly, five drams of this malt vanished amidst talk and laughter without much thought – now that is the best test of a great whisky. The only drawback to this malt – apart from its price – is that, despite being very enjoyable, it seems to underwhelm at first. That aside, each sip of this malt makes me want to go back for more – probably why this whisky has become my Friday night malt. It is perfect on a cold night paired with comfy pyjamas and a good movie. This entry was posted in Islay and tagged ardbeg, islay, malt, peat, Scotch, single malt, smoky, whiskey, whisky. Bookmark the permalink. Nice review! Perpetuum isn’t my favorite of the Ardbeg Day releases (that honor goes to Ardbog), but I enjoyed it! (Enough to pick up a couple of bottles for drinking down the line).